As we know that to get an enormous amount of traffic to our website we need our website to get indexed by popular search engines which are used daily by normal people. Yandex is one of them. It is very popular in Russia. So in this tutorial, we will learn how to submit website to Yandex webmaster tools. Create an account or directly sign in with your Facebook/Google/Twitter Account. At the top, you will see small add site button near my sites. Click it. Now enter the URL of your blog and click add site. Now verify your site by any of the method as same we do in Google webmaster tools. There are four methods by which you can prove the ownership of the domain and get access to site tools and advanced options. You have successfully added your website to Yandex webmaster tools. Go to your site in Yandex webmaster tools and click Sitemap files from Indexing option drop-down menu. 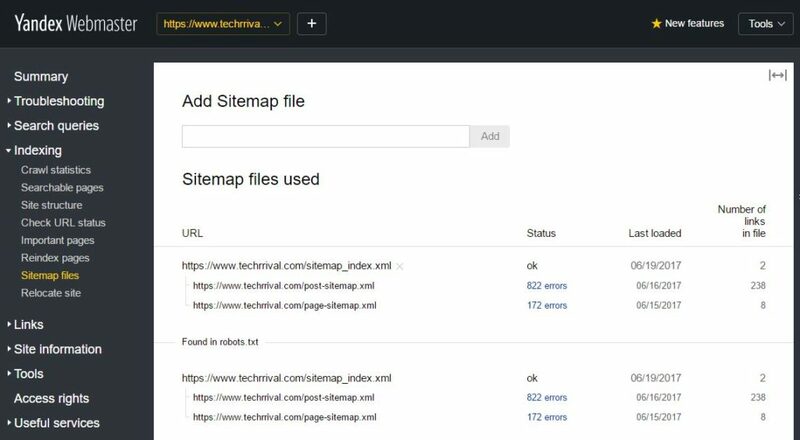 Yandex can also determine the sitemap files automatically using robots.txt file. So it’s a nice addition. Add your website sitemap there. You may also check other features of Yandex webmaster tools and it is very easy to use as that of Google. That’s a good article, but I wonder which webmaster tool is better Google webmaster tool or Yandex webmaster tool. Of course Google webmaster tools because it has some good features which are not available on yandex and also google is mostly used search engine…..